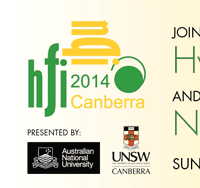 PAPER SUBMISSIONS HAVE NOW CLOSED FOR HFINQI 2014. All abstract submissions must be made on-line using the password-protected Abstract Handling Facility that is accessible via the button at the bottom of this page. The committee reserves the right to allocate a submitted abstract to either an oral paper or a poster presentation. A paper is only recongised as a conference contribution if the presenter registers for and attends HFI/NQI 2014. Abstracts must conform to requirements detailed in the abstract template. These templates are available from within the submit abstract portal. Please follow the link below, register and login to view. Abstracts will be accepted until 30 May 2014. Speakers invited by the Programme Committee will be allocated 25 minutes for "invited oral presentations" with 5 additional minutes for questions and discussion. PowerPoint or PDF projection will be available. Bring your presentation PowerPoint/PDF slides or.pdf files on a memory stick to the speaker's preparation room well ahead of your session or at the latest on the morning of your presentation, so it can be loaded onto the projection computer. We encourage you to also bring a back-up of your presentation on a separate storage device and make you aware that any audio visual content of your slides may not automatically transfer correctly to the projection computer. 15 minutes will be allocated for oral presentations with 5 minutes for questions. Oral presentations will be selected from submitted abstracts by the Programme Committee. aware that any audio visual content of your slides may not automatically transfer correctly to the projection computer. Papers selected by the Programme Committee for poster presentations will be on display in one of the two poster sessions. Authors are expected to attend their posters during the allocated poster session. Posters should include a title, the authors' names and the name of the institution where the work was carried out. We encourage presenters to structure posters well and to effectively combine written text with informative diagrams and photos.